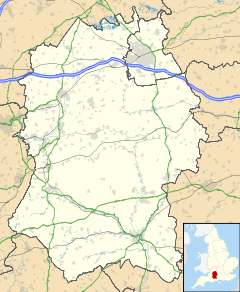 Broughton Gifford is a village and civil parish about 1.5 miles (2.4 km) west of Melksham in Wiltshire, England. The parish includes the hamlets of Norrington Common and The Common. Formerly much of Broughton Gifford and the surrounding area was covered with woodland. Much of this was felled during the First and Second World Wars. Villagers long used the common to graze their livestock and grow their crops. Although the common was not included when the rest of the parish's lands were inclosed in 1783, eventually its agricultural uses died out. The Wessex Main Line railway was opened across the southeast of the parish in 1848, following the Avon valley. In 1905 a small station, Broughton Gifford Halt, was opened for the newly-introduced steam railcar service between Chippenham and Trowbridge. The halt was southeast of the village at the Mill Lane bridge, near the road between Melksham and Bradford-on-Avon; it was closed in 1955 but the line remains open. The village has two parts. The lower village has the church, the school, the village hall and The Rusty Stag public house. There are also two housing estates and some detached houses in this part. The higher part, The Common, is a large area of open land with houses around it. As at 2008 there were three ponds on the common, inhabited by a paddling of ducks in their breeding season. At one end of the common is the Bell public house, and the football pitch and bowling green. The River Avon forms a natural boundary to the south and east of the parish. The civil parish elects a parish council. It is in the area of Wiltshire Council unitary authority, which is responsible for most significant local government functions. Unusually the parish shares some land in common with the parish of Melksham Without. The Church of England parish church of St Mary the Virgin, at the south end of the village, is from the 13th century and is a Grade I listed building. Additions in the 14th century included the south chapel, and the tower was added in the 15th. The rectory was built in 1848 to designs of T.H. Wyatt, and the church was lightly restored by G.G. Scott in 1878. St Mary's is part of the united benefice of St Katherine's at Holt, together with All Saints at Great Chalfield. A Particular Baptist chapel was built in 1806 on the east side of the common, and is still in use. A Wesleyan Methodist chapel was built in 1828 and replaced by a larger building in 1907. The chapel closed c. 2008 and is now a private home. In March 2015 Mr Daniel Gerber, of Gifford Hall, obtained a decision in the High Court quashing a planning permission granted by Wiltshire Council for a £10.5 million solar farm erected by Norrington Solar Farm Limited and Terraform Power. A packhorse bridge dating from 1725 spans the River Avon to the south of Broughton Gifford, providing a route (now a public footpath) to the hamlet of Whaddon. The village has a primary school, St Mary's, a short distance north of the church. Its first building dates from 1856, when it became a National School following the rebuilding of an earlier charity school. The school became Voluntary controlled in 1952 and was remodelled and extended in 1975. Broughton has two public houses. The Bell on the Common is on the common. The Fox, formerly the Fox and Hounds, is at the other end of the village. There are also a village hall, a butcher's shop, a small park and an industrial estate. Broughton Gifford is home to a war memorial in the form of an obelisk. ^ "Wiltshire Community History – Census". Wiltshire Council. Retrieved 19 September 2014. ^ Historic England. "Church of St Mary (1251257)". National Heritage List for England. Retrieved 7 March 2016. ^ "Church of St. Mary, Broughton Gifford". Wiltshire Community History. Wiltshire Council. Retrieved 11 March 2015. ^ "St Mary's – Benefice of Broughton Gifford, Great Chalfield and Holt". Retrieved 7 March 2016. ^ "Baptist Chapel, Broughton Gifford". Wiltshire Community History. Wiltshire Council. Retrieved 7 March 2016. ^ "Methodist Chapel, Broughton Gifford". Wiltshire Community History. Wiltshire Council. Retrieved 7 March 2016. ^ Historic England. "Gifford Hall, Broughton Gifford (1262897)". National Heritage List for England. Retrieved 11 March 2015. ^ Historic England. "Manor House, Broughton Gifford (1251184)". National Heritage List for England. Retrieved 11 March 2015. ^ Historic England. "Monkton House, Broughton Gifford (1262912)". National Heritage List for England. Retrieved 11 March 2015. ^ Historic England (13 November 1962). "Packhorse Bridge, Melksham Road (1251182)". National Heritage List for England. Retrieved 15 July 2014. ^ "St. Mary's Broughton Gifford V.C. C. of E. Primary". Wiltshire Community History. Wiltshire Council. Retrieved 7 March 2016. Pevsner, Nikolaus; Cherry, Bridget (revision) (1975) . The Buildings of England: Wiltshire. Harmondsworth: Penguin Books. pp. 150–151. ISBN 0-14-0710-26-4. "Victoria County History – Wiltshire – Vol 7 pp51-59 – Parishes: Broughton Gifford". British History Online. University of London. Retrieved 11 March 2015. This page was last edited on 8 June 2018, at 19:25 (UTC).